120/240 Volts, 56 Frame. 3450 RPM Note: order this item for all models, except model VT618902. Electric motors are pretty fool-proof, but every now and then you may have to replace it due to either the age (corrosion damage) or when you have a power surge or run the unit too long for an extended period of time. 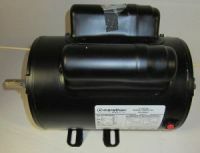 All air compressors motors are typically C.W. rotation (shaft away from you) and open style unless otherwise noted. Be sure to match up the horsepower, voltage, amperage, frame type/size, shaft size and phase type when replacing.